Garden Sparkle Blog: Fairy Hearts..
Hi hi and fairy blessings to your day! 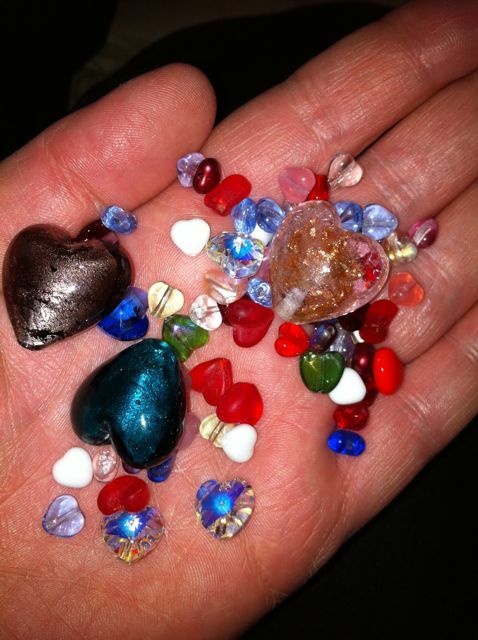 I just wanted to share with you a beautiful idea from the lovely Nordag.... Fairy Hearts! "In our home we are fortunate enough to have fairies visit our garden. We know that they come because they leave tiny glass hearts behind for the children to find. Their favourite place to leave them is in the sand pit but they can be found anywhere. They even seem to follow us to the beach and when we go on a family walk. When the children have had a bad time or have done something really good, the fairies leave larger hearts under their pillows. They love to find these and they become really special to them. The little girl in our house has one special 'dream heart' that she sleeps with every night that keeps the bad dreams away. We store our glass hearts in a little glass jar. The children love looking at them but if they have a friend who is upset, or want to show someone that they love them, they give the hearts away..."